Hello Everyone! For this week’s Free Psychic Exercise, please use the image below. As you are writing your impressions into the comment box below, remember to use phrases like “I saw” or “I felt.” It is the use of these phrases that allows you to be more accurate in what you receive. ALSO, the reality of what the image below is doesn’t really matter. Read through the comments from the other participants to see if anyone else received something similar to you. That’s the best way. Have a great time! Post your impressions from this exercise in the comments section below! I feel quiet & cold. Have a sense of longing and feeling the need to organize or clean up. A hurricane had just come through. Everyone wanted to clean up. I feel the inability to communicate. Cut off, isolated. Perhpas from a storm. My attention is drawn to the right, turning me clockwise around. I feel drawn there-I feel like I am heading down a slight incline/hill downward. Possibly a body of water of some sort. For some reason I am feeling like I am remembering my past….dont know why but I am thinking of Middle School. Awkwardness, going inward. Once again I am in the picture. Turning clockwise to the right all the way around to face the opposite direction of where the picture is aimed. I want to head in that direction…school possibly…. You are right about the hill, slope, and the water. Its sunday afternoon,everybody is at home,tv on,hot chocolate,cakes made home… Its raining out,a little bit windy,its automn…tomorrow its time to go to schoollllllllllllll…. I took this pic while my husband and I were on a walk – and it was Sunday evening. You are exactly right about what were were thinking. I see kids skateboarding when parking lot is empty. I also see that it gets busy with cars. Feels like a school or church maybe. I feel like it’s windy and a bit cool. Kind of a sad feeling as well. Saw lots of water in the street, not really flooding but lots of water…I don’t see rain though –just water spilled from a hydrant or water main. My upper legs and and palms feel strange -like i’m walking on all fours, or on my hands. update to my post…though I may not have posted anything that had to do with what was in the photo, my sister sent me a video just now, (about 5 hours after I posted my comments). http://www.youtube.com/watch?v=p7abSExQ-10. It’s a video of one of our local beaches flooding a parking lot due to high tide. This is what I was seeing in my head when i closed my eyes after viewing the photo. This is so fun! Lisa- this is correct. A hurricane had just come through. When I first looked at it I felt an empty feeling, then a warm feeling. I am getting that a storm just came through by the amount of leaves on the ground. I saw children playing in the grassy area all dressed up, as if going to a gathering of some sort. I am also getting old energy, like older adults possibly a nursing home. Weddings and other fancy parties typically take place in this building. Good job! I felt that something sad had happened. Everybody had left and it was a lonely place. I see someone (female) walking, carrying bags, tired. People passing. Disconnection, like missing home. I feel a pain in my chest, heart trouble, hard to breathe. I see it as a parade route, busy, bikes and a red car. I got the impression of weddings/church/hall but also school kids (daycare or elementary age)laughing and running around. I also sense a large body of water with summer homes/cottages nearby. Was thinking ‘lake’ at first but then smelled salt air lie the ocean. Overall I get a festive or celebratory vibe from this place. I heard: Crematorium, funeral-home, school, hotel. I saw: a straw hat with a black band. A Dalmation dog. Fireman in yellow coat turning off the hydrant. Pets buried in left section. procession of cars…funeral? Grandma waving from doorway. Software company near by. I felt that this was a place of relaxation like a sauna perhaps. Also, that mountains are not to far away. I see a church or possible a school. I feel wind maybe dampness, like it rained earlier in the day. I felt/smelled, a cold dampness like rain or about to rain. Correct. And it rained more after this pic as well. I felt that it was eery, especially as you looked further down the street. Like there was a lost soul wandering the street. I could hear voices. A family talking as they got out of a car. Then I could hear and see a young man talking to a teacher or Professor about his studies on the grass. My heart hurts. I feel something violent happened here. I feel lots of people unable to get over a death. Shock and unforgiveness. I see a group of people desperate to heal their experience and unable to see the role they are playing! It looks like ACC? I’ve worked there a lot in the past. I’m trying to not let my memory influence what I’m perceiving. Getting a heavy feeling in my chest. Anxiety…mostly about finances. I saw an older gentleman to the left.. up by that house, between the tree and the shrubs.. I feel sadness and loneliness. The leaves on the ground are tears the tree is shedding because we don’t consider the fact that they may have spirits like all living things – I get the sense they didn’t want to be there or don’t belong there. Aftermath of a strong storm. I see an older lady walking around in a nursing home. Using a walker in a cotton blue and white dress. Other elderly people around also. I thought about my sisters apartment complexes she lived in when she first left home and moved from Wisc. to Cal. But Michigan also came to mind. I got an unsettled feeling looking at the photo, even though it looked like the area had survived a mild storm. It looked too quiet. the scene feels quiet, reflective. A storm of some sort, (wind) has passed through, and it mirrors people’s feelings, – people in the buildings are gathering themselves after the tumolt. People are feeling uncertain but quiet. No panic no fear yet. Also an ominous feeling of foreboding. After summer storm. A church. Neighborhood. I want to say California ocean, but I can see there are East Coast trees. I felt an anxiousness….like a fear or worry. Then an emptiness. A great sense that this is not the usual scene for this location. Maybe an abondonment/evacuation. I sensed this is normally a place of children, perhaps a synagogue. I feel an empty, cold feeling. Its like feeling deserted. Wind swirling toward me, and around my left side, circularly. A sad and heavy heart. A yellow dandelion. middle school age kids–field trip or play? I feel like, yikes, I better get home. I was gone too long. I’m sorry. When I looked at the image I felt a certain stillness come over me. Almost as if time has stood still. I saw the beauty of nature and I also felt a healing presence in all of the greenery. Alot of time has passed for these trees and they have survived many, many seasons. They are still standing and they show us their amazing strength and resilience. We can learn alot from them. I also felt a certain peace go through my body and I see the importance of spending time in nature. Give the trees a hug and thank them for their presence in our lives. I feel peaceful… I see a father and daughter (about 7-8) walking down the street together with a yellow lab. She’s showing something to her dad – a small paper unfolding – she continually looks up at him, trying to get her point across. The dog is oblivious to this interaction; just happy to be along for the walk… not alerting to any birds or other animals… tongue hanging out with a big smile on his face (I feel it’s a him). Wanted to write here before I read any of the comments…. saw kids on bicycles… and then for some reason CAMPING came to mind…. tents…. and then a bit of sadness – like a transition, something ending, changing…. Maybe relating to something that was located there before? I feel an energy about this place that is spiritual. People come here to learn and to experience. They must open themselves up to do so, and therefore there is an energetic feeling to the place. There is also an underlying current of competitiveness, a feeling of unfulfilled dreams and dissatisfaction. I see people walking between buildings on there way to and from appointments or classes. I feel dizziness. The party’s over! I feel something fun happened here, like a wedding or other large celebration. Perhaps the night before. All the guests are gone and it is quiet once again. Happy memories, crisp and fresh. I feel sadness, lonely, wanting. I see haziness and wind. I feel like someone is hiding. I imagine a dog walking lonely through the lot, and a woman walking away from the picture, only see her back, not her front. I don’t feel like the dog and woman are connected. I feel I was oppressed, I feel anxiety and loneliness as if I were left out. I feel it could be a medical home or something about naturopathy in the building with arcades in the background of the picture. The main feeling is sadness, loneliness even though it seems to be a nice place. I feel shivers from damp and cold. I feel alone as if I’m waiting for someone to show up who hasn’t. My attention is drawn to the tree on the left side of the picture as if a person in spirit is standing there watching me. Then my eyes are drawn to what looks like a window just to the right of that tree and I see someone looking out that window – perhaps a spirit. I feel relief after a storm. I smell dampness in the air. I see someone out walking to view any damage in the neighborhood. Felt as if a church or funeral home or community center is nearby. Seems like there is great happiness and sadness flowing through. An older small community where most people know each other or know of each other. Farming community maybe. Recent rain. Feels like after a holiday, funeral, meeting, or most likely church service. Getting Baptist for some reason. I saw a wedding but discounted it as that is what i had also seen in the last exercise. I also saw a fire engine, an accident and someone ascending. I saw heard a wind storm blow by quickly. I felt relief that nothing hit the car. Get the impression of waiting for someone or something. Having Patience. I saw a ghostly figure in the right hand side of the picture…somewhere around the driveway. I saw a woman. She’s waiting and smiling??? 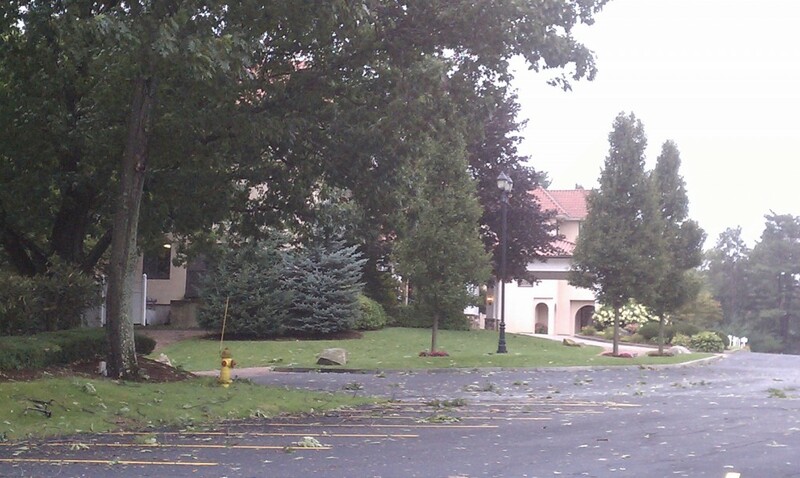 Affluent neighborhood – big storm came through – positive vibe of neighborhood. Feel like you’re familiar with the neighbors / n’hood. I feel job relocation in California. I am getting children playing, dogs, a kid getting hurt (knee) but nothing serious and bbq. I feel that there is an old historical museum where those yellow lines are for parking cars. It is somewhere in North–MA or NJ. I would love to take a walk there. I feel like I don’t want to have to go there. I’m hoping I won’t have to feeling. Uneasy. It’s all about feelings viewing this photo. Someone professional with controlling tendencies I am feeling I can’t avoid the interaction but I want to. Sunday ? California ? Maybe Carmel. Or Santa Barbara ? A time of resting, in a place that can be busy. i was also going to say church, or funeral home, people will be coming, but maybe not this day. I felt old school rules, academia, professor strict rules.smelled cypress trees, church up ahead. I felt like I had to go, or be there on a weekend. I feel that this is not a house in the sense people live there. I feel the picture was taken after a storm and I feel this is close to the coast. Early morning, a respite location. I feel postive vibes about the neighborhood. Im seeing a littile girl with two.long blonde pigtails with a bear in her hand. The little girl has blonde hair like her mom. But she looks like her dad. Which has dark hair. And the live in that tan house. I feel like I am walking towards home and that there’s a little girl or someone riding a bicycle to my right just out of the picture. Seeing her makes me smile and feel contented, happy. In the foreground I see someone old staring from the left side. Someone, many, passed on and in the upper right side they are looking down at the house in the background. Puzzled or guarding. It feels medical in some way. I taste antiseptic and smell cold metal…like a morgue. I feel stagnant energy in the center like it needs to be cleared and some of the brush needs to be pulled away to allow circulation. The building in the foreground feels “full”. Church or University down the street from Danielle’s house. I feel its part of a routine.or will be soon. I felt emptiness and cold. I thought maybe a storm had blown by, possibly a hurricane. Cars were run into, maybe an accident or they were blown over by wind. I felt lost people and lonliness, sadness and regret. I sensed a drifting away. I feel that its a place where people gather. I feel sadness, and I see black. People wearing black. Funeral I think. I also feel happiness, and gathering. I feel like it’s winter time on the weekend and everyone is at home, inside their house. I feel like there may be a school near by. I feel like this is a happy place. the parking lot is empty so it’s closed for the season maybe, like a golf club or resort??? it looks kinf of posh, that building I see anyway, but welcoming, a place of regeneration. The trees are peaceful but the people are not. Some heavy stuff goes on around here. Big life decisions. Business more than residential. Has an “official” feel to it. If the buildings and the type of people that come to them were gone it would be a more relaxing place. I didn’t really get much from this. I smelled rain and felt like I was in a wealthy neighborhood. But that could have just been conclusions drawn from visual clues. I feel a rain storm has occurred, I feel a sense of sadness but relief. I feel that the person taking the picture is using it as a memory, their thoughts maybe what is yet to come, a beautiful love of this place, heart and soul. I saw university, academic, out for the summer. Student, knife, crowd, plane, dog, prince spaghetti day. ??? the first thing that came to mind is this is the area that nicole simpson lived. at first i felt the house, place, was haunted. then i saw a woman in a green dress standing by a stove cooking, a couple of young kids running around. i sense a dog in the house. the storm is lifting and leaving hazy skies and debris on the ground. Chilly outside. Stay warm inside. I feel in transition. It’s been interesting, when I first looked at the picture I saw everything in fog and blurred. A good day for some reflection. Then I looked again and saw the first part in the picture suddenly clear and the fog in front of me lifting, and I could see further into the distance. It all makes sense to me. School campus, end of September on the weekend. looks like a school on a non-school day, like vacation or maybe closed altogether….light wind, leaves are being blown around, but just sliding along the ground. it’s part of a bigger facility maybe on a hill. I feel the attempt to make a townhouse look like a villa. Lots of money, but a money can’t buy happiness feeling. I see a car with a boat trailer and boat. The car is not that new. A station wagon of some sort. The house sits empty a lot and says “I’m not happy, I’m lonely”. The house would enjoy children, probably grandchildren. I feel like this is a spot where people might meet to sell drugs or drink because it’s empty for such long periods. I feel very unsettled young male energy in the parking area. Colorado? Dead end Street feels deserted Blond young daughter 10 or 11 yrs old looks happy in snapshot…dog…Mom and Dad ..Danielle’s neighborhood? feel isolation built 1970’s …couple seperated now…friendly people…water close by. Misty afternoon in England. Stuffy. Uppity people…in this area of town. Hailstorm, hard rain… wind. Taped off at some point. Investigation? I feel the emotion of ominous. I’m pretty sure a dog has marked one or more of those tree! Hmmm. Yea, quite sure now. Doesn’t seem to be any worms around. Rain, no worms… a worthy investigation. I feel fall or winter, children playing on the streets, and as if I am driving to work. I see a narrow road with trees on both sides. Something feels empty or missing. I felt chilly. I smell rain and feel wind. New Jersey? calm after the storm. warm quiet. maybe sunday afternoon. 1960’s came to mind. Saw cars parked, people dancing, women wearing formal gowns and white long gloves, then saw woman in wedding dress, dancing with groom.